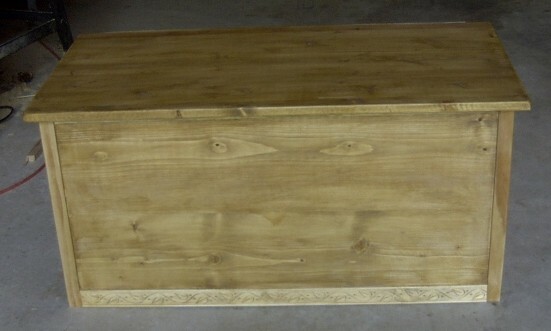 The inside of the box was stained and varnished the same as the outside, and was left unlined. I added handles to each side of the box after this photo was taken, but that was all that was left to do. I feel that this toybox turned out the best by far of all the items I’ve created. I felt truly inspired while making it! 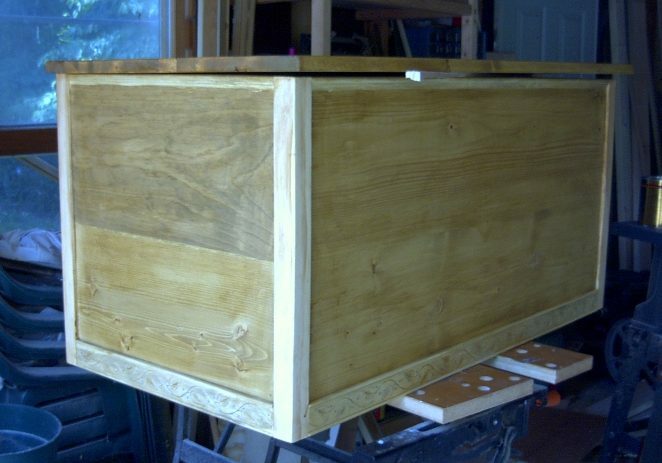 Here’s a front view of the entire toybox with two coats of varnish applied to all the surfaces. I think it turned out pretty well; the woman I gave it to certainly thought so! In this closeup you can see how the stain affected the molding. I wiped off the stain as soon as I applied it, so the majority of the stain was left in the engraved leaf pattern. Some also soaked into small cracks around the leaves, providing a nice contrast to the patterns. I also took a narrow paintbrush and dipped stain directly into the engraved sections. Drips and runs were sanded off before any varnish was applied. I stained the solid wood panels twice to get them darker than the molding, and then drybrushed the ivy molding to highlight the engraved portions. The other moldings were stained and then wiped off to keep them from becoming as dark as the wooden panels. I used a Golden Oak color stain from Glidden on the box. The top has also been installed and was stained at the same time the rest of box was. 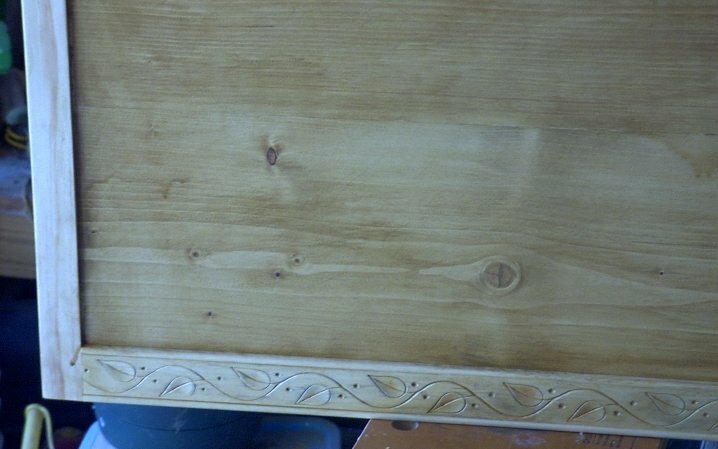 The piece of wood holding the top open keeps the pieces from sticking together as the stain dries. 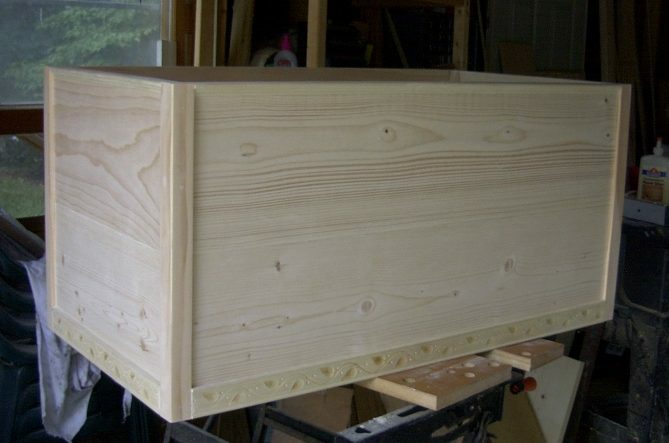 This is the assembled box base front, with the leaf molding on the bottom, the edge molding at the top, and the vertical corner moldings all attached. 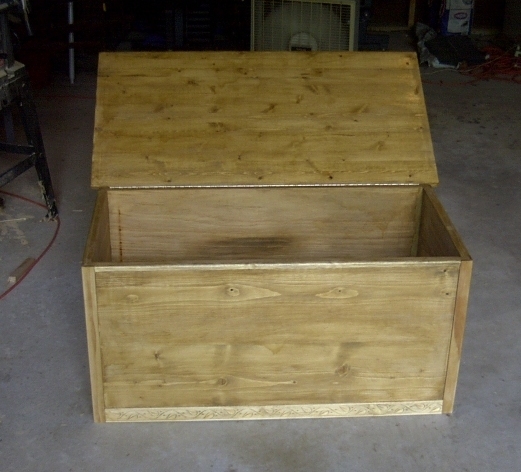 I’ve already sanded the box and it is now ready for staining.